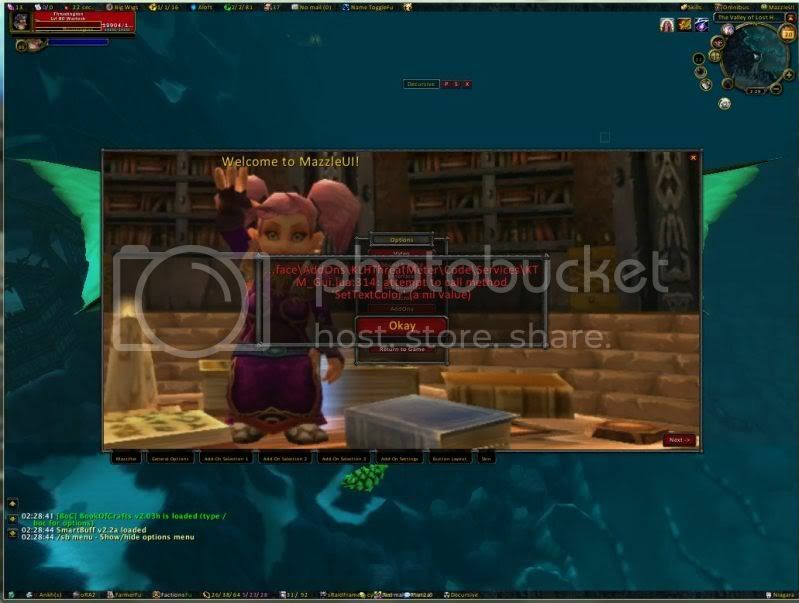 WoWInterface » AddOns, Compilations, Macros » AddOn Help/Support » STILL cant get mazzle to work! STILL cant get mazzle to work! Argh, ok so i've spent about 3 hours setting up mazzleui, finally got it to come up with the mazzify thing when i first start it up, but instead of it being like this pic..
with everything down the bottom, my map is up the top right, theres titanbars(maybe?) up the top and bottom, and a chat thing, then a few random boxes from different addons, and when i try to click "next" or any of the tabs at the bottom of the mazzifyer, nothing happens!!!! Sadly, MazzleUI has long been dead. It was the UI of UIs back in it's day. I haven't tried it yet but nUI, has quite a large following and seems to be the MazzleUI of today. It's very well supported, and easy to use, as I understand. Mazzle is long dead. Many of the core AddOns are simply broken and the AddOn author has replaced them with totally new AddOns. - a number of the custom Mazzle mods are either broken or have some issues with 3.x. The Mazzlefier dpends on Bongos however with Bongos now broken, the Mazzlefier will barf errors and fail to complete the job. - a number of other mod's "guts" have completely replaced with newer libs (most of the Ace2 based mods now use Ace3, FuBar uses Rock). - Some mods are completely replaced by default Blizzard functions and mods that depend on those other mods are broken (Threat 1.0/2.0, ParserLib, etc). Several people have taken stabs at revamping MazzleUI and even got Mazzle's tacit approval, however nothing has ever come from these efforts. Past maintainers have disappeared, possibly due to the amount of work that is needed to maintain MazzleUI in a form that is usable by most players. Mazzle no longer plays WoW nor as she played WoW for a couple of years. In short MazzleUI is dead. You can take the art panels and using current mods, build yourself a Mazzle look-alike that will have much the same look and feel of MazzleUI. However you will not get alot of the automation (such as the bar-set up) that Mazzle had. Mazzle is dead. Long live nUI!